What to do with daikon. Its been a while since I posted- partly because I have been working on another garden project (will provide an update soon!) and partly because the chooks have found a way into the vegie patch (still haven't quite figured out how they are beating the system as they are also smart enough not to do it when I am around). This has meant that my bountiful brassica harvest has become somewhat less bountiful. Hopefully my other project will provide a chook free solution next year... but in the meantime one thing I have been left with, is my crop of daikons (Japanese white radish). A friend of mine gave me seeds a few years ago- and although I was not huge daikon fan - I was won over by the fact they are easy to grow at a time of the year when not much else is. Armed with surplus daikon here's a sample of my daikon repertoire. This is one of my favourite Korean comfort dishes so I was excited to come across a recipe as part of the SBS Food Safari series. The recipe is not difficult. 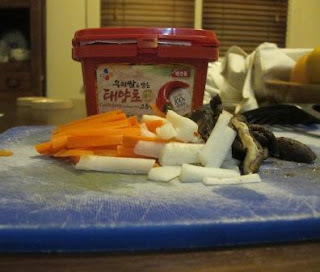 It requires Korean chili paste (not super hot) - buy from the Korean section of a good Asian grocer (for Melbourne people I love Great Eastern- in Russell Street in the City). Take a few ingredients such daikon, carrot, bean sprouts, spinach, shitake mushroom, sliced beef, steamed short grain rice and a single egg per serve. Chop and cook meat and vegies where necessary (in this case I left the carrot and daikon raw, bean sprouts can also go in raw). I had previously thinly sliced and marinated (with some Korean BBQ sauce) some left over eye-fillet and put it in the freezer ready for use with this dish (you don't need to marinate the meat but it adds flavour). The hardest bit is sourcing a 'stone' pot. (I note that all the comments on the SBS site associated with the recipe are about the pots!). My quest took brought up various lost in translation moments at a couple of Korean supermarkets but eventually I found some cast iron pots (with wooden serving trays) in one of the Asian cookery supply stores in Bridge Road Richmond (one of Melbourne's famous Asian food precincts). 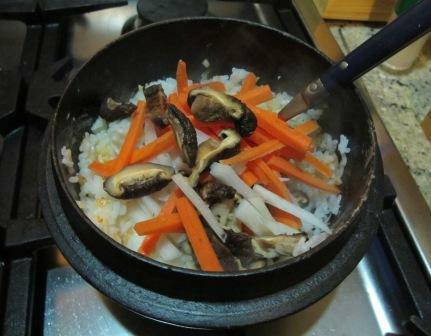 The pot is the crucial part of the recipe. 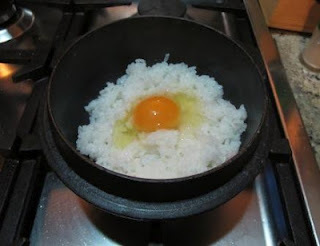 Place the pot on heat and add a few drops of sesame oil before adding a single serve of steamed rice topped with an egg. Allow the rice to crisp up (you should hear it crackle). Check to see if its browning a little and then turn off the heat. 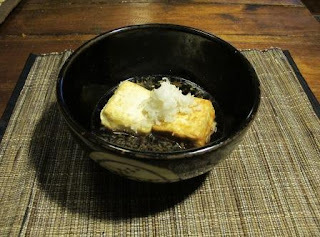 Use a relatively firm Japanese/ Asian style tofu for this recipe. To prepare the tofu, drain it and place it between paper towel with a weight (eg. a plate) on top to press out as much water as possible. Prepare the stock- you can use a ready made 'tsuyu' soup base (see my post on making 'donburi') or make a soup base using a watery version of my don sauce recipe you can add a tiny bit of grated ginger if you wish. Warm it on the stove and place in a bowl. Dust the tofu in flour (note: in the past I have used Japanese/ Korean potato starch flour from the Asian supermarket for a light bubbly batter, but regular wheat flour is fine). Deep fry in vegie oil and drain. Drop the tofu into the sauce. 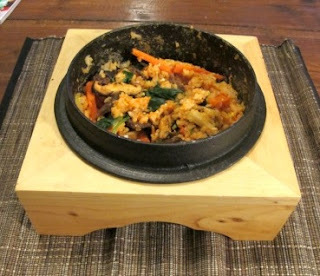 Top with finely grated diakon using a ginger grater/ microplane grater. Mix baby spinach with daikon match sticks - top with a Japanese style dressing and toasted sesame seeds. *Note -'wafu' means 'Japanese style' in Japanese. And there you have it three uses for daikon.